If the interceptor in Sunday's test hits, its test record would be one-for-three. Good for baseball, bad for stopping nukes. The United States has better alternatives. In 2004, President George W. Bush began fielding the Ground-Based Missile Defense (GMD) system that is in place today, composed of 30 interceptor missiles in Alaska and California, intended to counter a possible long-range missile attack from North Korea or Iran. Ten years later, it is all-too clear that the prototype system was rushed into production before the technology was ready, to address a hyped threat that has advanced but still not materialized. The American taxpayer is now stuck with a $40 billion "defense" on which no leader can depend—it has a dismal test record that is actually getting worse with time. The system has failed in its last three intercept tests, and has not hit a target since 2008. "We recognize the problems we have had with all the currently fielded interceptors," Frank Kendall, the Undersecretary of Defense for Procurement, said about the GMD system earlier this year. "The root cause was a desire to field these things very quickly and really cheaply." As for the threat, Dean Wilkening, a missile expert with Lawrence Livermore National Laboratory, said this month that one of the problems with missile defense is that "we have tended to exaggerate the [intercontinental ballistic missile] threat to this country for a long time." There are important lessons here. Don't rush a complex weapon system into production while it is still a prototype. Don't base plans on exaggerated threat assessments. And above all, don't compound the problem by rushing a system to address a hyped threat. Unfortunately, the Obama administration is on the verge of repeating the same mistakes. The administration now wants to double-down on this troubled system and expand it. This would make no more sense than Bush's decision to prematurely field the system in 2004. This Sunday, June 22, the Pentagon is planning to conduct the next test of the GMD's Ground-Based Interceptor (GBI), and if successful, plans to add 14 interceptors to the existing 30 by 2017. This roughly 50% increase will cost about $1 billion. Defense Secretary Hagel first announced the plan to expand the system in March 2013, as a response to previous North Korean nuclear and missile tests, and also made the wise decision to cancel the fourth phase of U.S. missile defense plans for Europe. Since then, two important things have happened that should prompt the administration to reconsider expanding the GMD system. First, in July 2013 the GBI failed its third intercept test in a row. This test involved the CE-I "kill vehicle," which is supposed to collide with an enemy warhead in space. This failure came as a particular surprise, because this kill vehicle had a better test record than the one to be tested on Sunday, the CE-II, which is zero for two. Second, faced with failures of both the CE-I and CE-II, the Pentagon's chief weapons tester raised concerns in January about the system's reliability and suggested that the kill vehicle be redesigned to assure it is "robust against failure." And in March, the Missile Defense Agency (MDA) announced that it would make major changes to the kill vehicle, planning to spend $740 million over the next five years to do so. Vice Admiral James Syring, director of MDA, testified before the Senate this month that the new kill vehicle "will improve reliability and be more producible, testable, reliable, and cost-effective and eventually will replace the kill vehicle on our current GBI fleet." The new kill vehicle could be fielded around 2020. Now, given the acknowledgement that the current kill vehicles are so unreliable that they need to be redesigned, one might think that the Pentagon would extend the timeline for fielding the additional 14 interceptors to give itself the option to use new and improved kill vehicles, instead of the current, failure-prone ones. But no. The Pentagon is sticking with the 2017 deployment date, so expansion would have to go ahead with the old prototype kill vehicles. The Defense Department is acting as if the next test would demonstrate that the kill vehicle is reliable. But even a hit would show no such thing. The CE-II has been tested only twice before, and missed both times. If it hits on Sunday, the test record would be one-for-three. Batting .333 may be great in baseball, but against nuclear-tipped missiles it is simply inadequate. Moreover, as the independent Government Accountability Office pointed out this month, the system is still a prototype: "There's a whole series of tests to fully prove out the [CE-II] capability that go into the early 2020s as planned. So, we're still just in the early stages of proving this thing out." And Philip Coyle, former Director of Operational Test and Evaluation at the Department of Defense, said this month, "why should we deploy more of these CE-IIs now that MDA has decided to redesign the kill vehicle? Well, we shouldn't..."
Why is the United States rushing to failure again? For the same reason Bush did in 2004--the perceived threat. 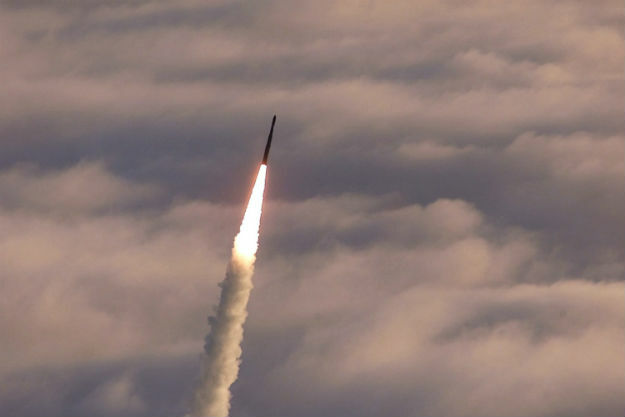 It is easy to say that "we must stay ahead of the threat," but neither North Korea nor Iran has tested or deployed a long-range ballistic missile that could reach North America, and if they do there are already 30 GBI interceptors fielded on the West Coast. Instead of spending scarce defense dollars on additional interceptors that don't work, the Pentagon should take the time to fix the system it already has. Fortunately, foreign missile programs are not progressing as swiftly as many had feared. As Adm. James Winnefeld, Vice Chairman of the Joint Chiefs of Staff, said May 28, neither North Korea nor Iran "yet has a mature [long-range ballistic missile] capability, and both nations know they would face an overwhelming U.S. response to any attack." Indeed, as Winnefeld implies, it is not missile defense that would stop a missile attack from North Korea or Iran, if they achieve that capability. It is that neither regime wants to invite upon itself a devastating U.S. response. Rather than repeating the Bush administration's mistakes, the Obama administration needs to shift gears. The Pentagon should prioritize upgrading the kill vehicle, a process that will take a few years, and not expand the system until the new interceptor is proven to work. There is still time for President Obama to take a page out of President Bill Clinton's playbook. When Clinton was considering a missile defense deployment in 2000, he based his decision on four criteria: the readiness of the technology, the impact on national security, the cost of the system, and the threat. Ultimately, Clinton rightly decided that he did not yet have "enough confidence in the technology, and the operational effectiveness...to move forward with deployment." He noted that there were unresolved questions about countermeasures, or efforts to "confuse the missile defense into thinking it is hitting a target when it is not." Clinton's conclusions still hold true today, and Obama would be wise to consider them. Hit or miss, the results of just one test are not enough to justify expansion. Obama may have inherited the GMD system from President Bush, but once he expands it, he owns it. And this is one mistake that President Obama should be in no rush to add to his legacy.